NEW YORK (Reuters) - Retail investors are returning to bank loan mutual funds following seven straight months of outflows, with the Federal Reserve more clearly signaling an interest rate hike and higher secondary loan market prices starting to attract momentum buyers, investors and strategists said. The first weekly inflows of $130 million broke a 31-week streak of outflows in the week ending February 18. Although net flows turned negative again with $118 million withdrawn in the week ending February 25, they have moderated and are seen turning positive with Fed rate hikes nearer, these sources said. 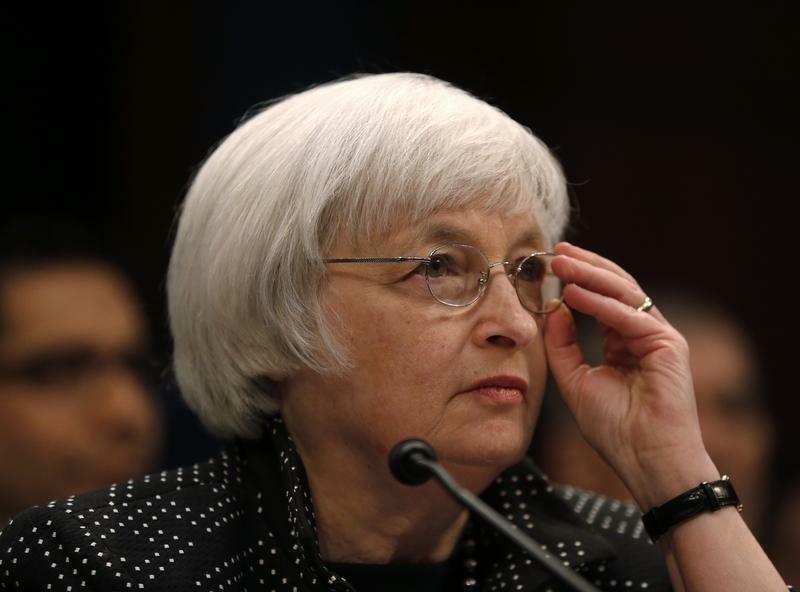 Fed Chair Janet Yellen's congressional testimony this week increased confidence that the central bank will raise interest rates this year for the first time since 2006, although Yellen refused to be pigeon-holed on precise timing. Floating rate loans provide a natural hedge against rising interest rates. Retail accounts poured $81 billion into bank loan funds for 95 straight weeks until April 2014, Lipper data shows, before global economic concerns and crashing oil prices held U.S. interest rates low for longer than most economists anticipated. When the interest rate rise failed to materialize, retail accounts started a seven-month exodus that saw around $36 billion pulled from loan funds until the pace slowed this month, according to Lipper. "Retail investors capitulated over the summer on rising interest rates," said Leland Hart, head of BlackRock's bank loan team. "A rate rise will likely have to stare them right in the face because people have waited so long for it to happen." Whether rates rise in June, or in September or October as some economists predict, higher interest rates are now within sight after several false starts that triggered selling in the loan market, strategists agree. Fears of over-valuation in the leveraged finance market are also subsiding, spurring the gradual return of retail investors to leveraged loans. Fed and other government officials, concerned about a bubble forming in junk bonds and leveraged loans, clamped down on risky deals in mid-2014 to try to cool aggressive borrower-friendly terms driven by robust investor demand. "It had gotten to the point where it was definitely a borrower's market, and that probably scared a lot of people off when rates didn't rise," said Jeff Tjornehoj, head of Lipper Americas Research. "Once people love loan funds, they love them for a long time until they don't love them, and then they don't love them for a long time," he said. Talk of a bubble has also subsided, however, and Yellen did not highlight below-investment grade corporate debt in her congressional testimony. Investors now see the leveraged loan market as better aligned and valued, after volatility widened spreads, pushed average secondary prices to more than a two-year low of 97.16 and led to sweeter terms on new transactions. Interest rates are setting the tone and 2015's swings in Treasury yields have helped to raise confidence in the loan market that the Fed is on course to tighten monetary policy this year, investors said. Heavier outflows persisted as Treasury 10-year yields sank to about 1.64 percent on January 30, the lowest rate since May 2013, before abating in recent weeks as the Treasury yield hovered around 2 percent. There is also growing evidence that leveraged lending guidance from U.S. regulators is reining in some of the riskier deal structures that were seen last year. Although the loan market is seeing a supply-demand imbalance again, with a relative dearth of new primary deals rather than abundant volume, there is more of a two-sided market this year. "Leveraged lending guidance will have some effect" in tempering froth, said Steven Oh, global head of credit and fixed income at PineBridge, adding that retail investors in loan funds are typically momentum driven and tend to follow market shifts. Secondary loan prices are rebounding, boosted by continued demand from Collateralized Loan Obligation (CLO) funds. New CLO issuance this year of about $12 billion is higher than the same period in 2014, although estimates for the full year of $60 billion to $100 billion for 2015 are below last year's record $123 billion. Average bids in the overall secondary loan market were 97.69 late Wednesday, up from 97.43 at the end of last year, according to Thomson Reuters Secondary Market Intelligence. The average bid in the SMi100, which measures the 100 most widely held loans, was 98.82, up from 97.75 at year-end. If retail demand is sustained, loan funds could start to compete with CLOs for leveraged loans, which could cause spreads to tighten, Deutsche Bank analysts said in a February 25 report. Retail investors have been pulled in recently by the sharp increases in secondary loan prices, the analysts said, and fund inflows will subside as prices stabilize. "Over the medium to longer term, however, we still believe that the prospect of rising rates should slow outflows as investors rekindle their love for the floating-rate nature of leveraged loans," the analysts said.